Dear literature lovers, have you grown sick of simple sentences? Deadened to the doldrums of dry, dusty prose? I, and at least one other guy, agree with you. And after all, don’t we have a right to be upset? These days American literature has taken on the drab and isolating austerity of an Edward Hopper painting. Once bold and fresh, the pared-back writing style of literary greats like Hemingway and Carver has grown limp and weary—flaccid as a neglected houseplant in the fits of winter. This Wednesday, The New York Times published another installment of Draft, a series of essays that hone in on the “art and craft of writing.” In this week’s selection, “A Short Defense of Literary Excess,” the 24-year old British author Ben Masters (who’s pretty cute for the literary type, in case you wanted to know) wrote about his love for writers who revel in the musicality of a poetic sentence and the long hours of tinkering that can occur in the process of perfecting the rhythm and diction of phrasing. In the article, Masters describes a few of the great baroque stylists: Vladimir Nabokov, Saul Bellow, Virginia Woolf, David Foster Wallace, and others. For Masters, these authors open the doors to the house of literature, allowing it to breathe and expand. So what do you think of this Masters? Does he waggle his roseate pinky finger as he sips from his china tea cup? Who knows. But I don’t think so. I think I agree with him. American prose has become unplayful and stiff, like a collared shirt flattened and then doused with too much starch. After all, when was the last time we frontier-forgers won a Nobel? Not since 1993, with Toni Morrison’s gorgeous, sometimes surrealist prose. Just as this article came out, I was in the middle of reading The Street of Crocodiles, a book by a Polish author, Bruno Schulz, who was Poland’s preeminent writer in the years between World War I and World War II. Schulz, a Jew, was shot in the head by a Nazi in World War II, and we only have his slim oeuvre of fantastical stories and eery drawings to let us know how much we’ve missed by that loss. Take these two sentences, the very first from The Street of Crocodiles. When was the last time you read something so gorgeous, so wonderfully unexpected and vivid? 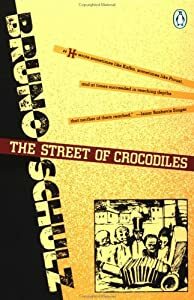 Schulz’s book, The Street of Crocodiles, is a collection of short stories that act as a kind of fantastical memoir of his own childhood and the growing mania of his father. Just as his father becomes obsessed with the cockroaches that steal around the house, the exotic birds he raises in the attic, and the inanimate objects he infuses with lungs and breath and evil intentions, Schulz’s narrator uses madness’s close cousin—the fantastic—to describe this childhood from the perspective of a man looking back on his youth through the lens of that same vivid, childish imagination. How, then, to create art? For some, the answer may be found in creating poetry from prose, thereby elevating the way we communicate to a higher plane. But really, that’s not an answer, because just think of all the writers who have attempted excess in prose and instead been sucked down inside the quagmires of their own pretensions. The best authors are those who can alternate between the high intricacy of the ornate and the dry marrow of the simplistic to create dynamic, destabilizing prose that truly captures the way humans think, act, and dream their worlds. What do you call a mix of purple prose and bland, Puritanical austerity? I, for one, call it Lilac Prose, and I think you should, too.